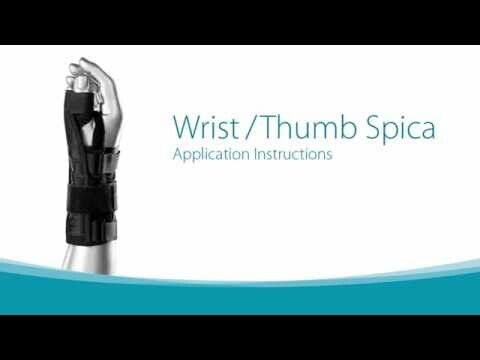 The Wrist Thumb Spica helps ease the pain and speed recovery of many wrist and thumb injuries. We've designed the brace to be lightweight and comfortable while providing the necessary support to injured wrist and thumb joints. Ultra-soft micro-fleece is placed against the skin and a customizable, aluminum stay is used along the CMC and MP joints for immobilization. The design allows for full use of your fingers while immobilizing the injured thumb and providing compression to the wrist joint for extra blood flow and enhanced recovery. Since there are no laces, the brace is quick and easy to apply with one hand. Relieve the pain and symptoms from arthritis, bursitis, De Quervain's, Scaphoid fractures, sprains and strains with the Wrist Thumb Spica. The low-profile design provides comfortable support where you need it most. A customizable, lightweight stay immobilizes the CMC and MP joints so your wrist and thumb have the time to heal. Comfortable compression is applied to the wrist joint with adjustable straps and ultra-soft micro-fleece against the skin. The added compression around the wrist boosts recovery by increasing blood flow to the area. The Wrist Thumb Spica is designed to provide protection to the wrist and thumb joint. The brace controls motion of the CMC and MP joints to prevent further injury. Extra compression around the wrist alleviates pain and improves proprioception. Increased proprioceptive feedback to the brain improves coordination of the joint's movement, further preventing potential injury.